There is no excuse why we can’t have equality in education. I think we have the resources to do it, we’ve just got to have the will. I didn’t see the video before it was pulled so I can only go from the printed word, but the diction of the quote seemed odd to me. I guess because it doesn’t mention teachers, and teachers are the entire focus of the case. Equality? Resources? Well, of course– but using the courts as an end-around to undermine unions didn’t seem like something Huerta would support. I thought it was unfortunate, and moved on to other concerns, forgetting about the issue for a while. 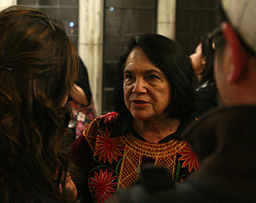 LATEST: Oral arguments for Vergara v. State of California set for February 25, 2016 in Los Angeles.Labor leader and civil rights icon Dolores Huerta will join educators and community members for a news conference Thursday morning, immediately prior to oral arguments. Mystery solved! I’d love to learn more of the backstory. 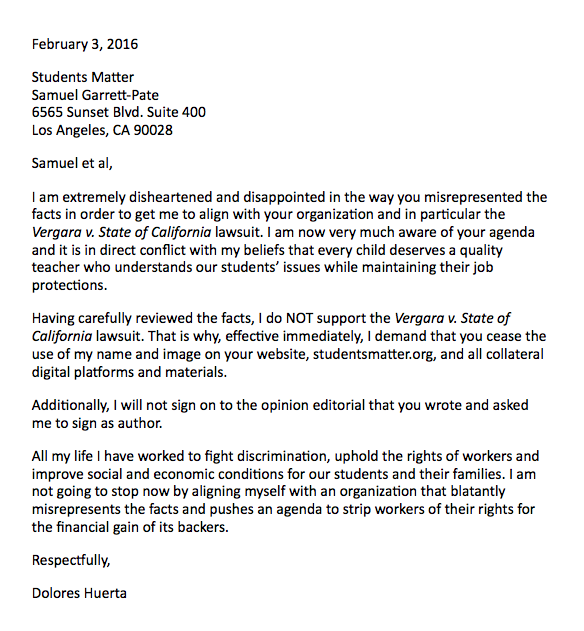 How carefully did Samuel Garrett-Pate have to choose his words and facts in order to secure the ill-gotten endorsement of Dolores Huerta for a case she clearly disapproves of now?